Americans consume tons of white flour products daily. “So what?” you may ask? What if there is a link to the #1 cause of death in the US? What if we could replace empty calories with a treasure of top nutrition? What has this to do with what we have always been told causes heart disease, e.g., saturated fat? And most importantly, what if we now have multiple studies reveal- ing the real cause is not fats at all? A recent analysis of 21 studies in which there were 350,000 participants, found “no significant evidence” that saturated fat is associated with either increased coronary heart disease (CHD) or cardiovascular disease risks, according to the report in the American Journal of Clinical Nutrition (AJCN). Instead, these authors of research suggested that high glycemic foods that replaced the saturated fats are responsible, particularly foods of “enriched” white flour that is quickly converted to blood glucose, in addition to sugary foods. Again, the researchers of 21 different studies found almost no evidence that saturated fat is a causality factor for heart disease, but that refined carbohydrates are! Do you understand that is radically different than what we have been told for 65 years, since 1950? “People who cut out saturated fatty acids while upping their intake of white bread, pasta, and other refined carbohydrates [e.g. processed sugar, fructose, and high fructose corn syrup (HFCS)] that can cause blood sugar to spike aren't doing their heart[s] any favors,” new Danish research shows. Yet there is nothing new about the association of refined carbs with all the degenerative diseases developed since the counterfeit, faux-foods industry was established more than a century ago, beginning with processed vegetable oil just before 1900. Animal-source saturated fat intake has been reduced since the fifties and yet heart disease remains the #1 killer disease, with annual deaths having increased 100% from half a million to nearly one million since then. Mononitrate, the source for vitamin B1 in enriched flour, so called, derived from extracts from non-organic corn and soy, and Mid East and Chinese petroleum products, can have serious adverse effects. For one, the nitrates in thiamine mononitrate may accumulate in the kidneys, leading to kidney stones as well as cellular death. MedlinePlus warns that those with impaired kidney function may have difficulty filtering nitrates and should avoid thiamine mononitrate. This commonly used substitute for vitamin B1 thiamine (read ingredients’ labels before purchasing processed products) is also known to cause allergy for some, even terminal cases. The synthesized, isolated vitamins have replaced the Creator’s in whole grains but are no match for the latter. 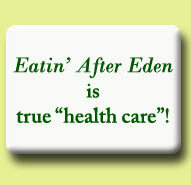 The removal of nutrients from grains is for the profit of the merchant, not the health of the consumer. After all, if you loaned me $1,000 and I repaid it with “dollars” I had altered, would you consider yourself enriched with the counterfeit? Would it not be reasonable to believe that had these women always consumed a diet with moderate amounts of the healthy saturated fats and avoided refined, simple carbohydrates, they might never have developed the atherosclerosis and even the diabetes? Do you suppose they likely would not have put on the weight either? I recently had a 280 pound friend who lost 25 pounds within a few weeks when she simply quit adding sugar to foods. That rate will not continue and I like to see no more than one or two pounds lost per week. The point is that she did not reduce fats. 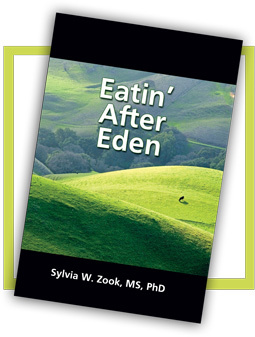 The very revealing chapter in Eatin’ After Eden that explains fats, heart health, conventional diets, and the surpris-ng facts in detail, is also a noted eye opener. Monounsaturated fats of avocados are beneficial to your heart, especially when eaten in place of man-made trans fats and inferior carbohydrates. A simple way to identify oils that contain monounsaturated fats is to think of those that are liquid at room temperature but turn somewhat solid when refrigerated. Extra virgin olive oil is another that contains the very healthful monounsaturated fats. However, we should ask if the brand we are considering has been processed at low temperatures or was cold pressed, and not chemically extracted. Avocados (and kiwis) often are not sprayed or are sprayed little with pesticides even if non-organically grown as they are bothered little by insects. Monounsaturated fats as found in avocados can help balance HDL and LDL cholesterols in the blood, thereby further reducing risk of heart disease and stroke. Avocados are also high in heart protecting antioxi-dants. Monounsaturated-rich fats it provides us also contain vitamin E, one of its antioxidant vitamins, another contributor to heart health. Certain vitamin isolate supplements can sometimes be helpful; however, most supplements of or with vitamin E do not contain but one of the eight molecules of vitamin E found in avocados, whereas only one of this synergistic source contains more than 20% of the recommended daily requirement of this vitamin complex. The next time your physician advises bananas for potassium, gently inform him that avocados have a whopping 60% more of this very important mineral than do bananas. In fact, there are few vitamins and minerals not found in avocados, this repository of nutrients, including the entire vitamin C complex (not just ascorbic acid, the “outer shell” of the complex) plus all the B vitamins except B12 which is found in animal source foods. It is of significance that this ugly blessing aka alligator pear, has the greatest amount of fiber of all fruit, with 75% insoluble and 25% soluble. Natural Health 365 is an excellent source of pertinent information regarding this one of the Creator’s richest resources of our bod-ies’ supplies for optimum wellness. In all, avocados provide an impressive total of 20 nutrients and phytonutrients. Its vitamin E is critical for the very young, the elderly, and during the childbear-ing years according to Dr. Mercola. “Insufficient vita-min E can increase your risk for a wide variety of dis-eases, including immune dysfunction, cognitive deteri-oration and cardiovascular disease,” he alerts his readers at his website Mercola.com, August 8, 2016. Inflammation, now strongly implicated in heart disease and others, is opposed by this vital vitamin that also assists the body in absorption of the very important fat soluble vitamin K, another heart-healthy nutrient. Further, “...adding avocado fruit can significantly enhance carotenoid absorption from salad and salsa, which is attributed primarily to the lipids [fats] present in avocado,” according to an amazing study performed by the Department of Food Science and Technology at Ohio State University titled, “Carotenoid absorption from salad and salsa by humans is enhanced by the addition of avocado or avocado oil” (Journal of Nutrition, March 2005). Be sure to see the recipe below providing avocado and salsa together! This itself is no small benefit since many people do not well convert the vitamin A pre-cursor in carrots and other carotenoids to vitamin A that can be utilized by the body. Avocado appears to be “a potent warrior in the fight against prostate cancer,“ according to more recent research. It is noteworthy that it provides the highest amount of the carotenoid lutein of all the more common fruits. In addition, avocado contains related carotenoids, including zeaxanthin, alpha-carotene, and beta-carotene, “notorious cancer fighters.” Another recent study reports that an extract of avocado containing these carotenoids and tocopherols inhibited the growth of prostate cancer cells. However, when lutein was consumed alone, it was ineffective against the cancer cells. The Creator’s synergy of fresh, whole foods is matchless. “The whole is greater than the sum of its parts,” Aristotle so aptly described it. The 83,000+ pre-menopausal women reported by the infamous Nurses Health study, even with a family history of breast cancer and who “consumed the highest quality of vitamin E, had a [remarkable] 43 percent reduction in cancer cases.” Furthermore, women with increased intake of lutein in their diets have been shown to have a lower risk of breast cancer. Oleic acid, the primary fat in this fruit, also offers studied and proven protection against this cancer risk. It not only supports absorption and utilization of antioxidants, it also does double duty by supporting phytonutrients consumed in other foods! Besides antioxidants for heart health, and much else for prostate, breast, and other cancer fighter, as we said, this fruit also contains lutein, a carotenoid, and an important antioxidant that is associated with lower risk for eye diseases by reducing the risk of macular degeneration, the leading cause of blindness in adults 65 years of age and older. (Kale is most valuable for this as well.) At the same time it helps maintain vibrant skin. Now, how 'bout a fast and tasty nutrient-dense snack recipe for heart health, a replacement for pastas? The following low carb avocado recipe is appropriate for weight loss with its ingredients of healthy fats, and quality protein, containing none of the unhealthy refined sugar or white flour, or other manufactured ingredients of many snacks. Eaten in the afternoon, unlike inferior carbohydrates from the snack bar, this small amount of wholesome food "sticks to the ribs" well into dinner time. Cut around the seed; then carefully twist to remove halves. Insert a pointed knife into the seed and pry it out. Fill holes where seed was, with ricotta cheese, then add olives and tomatoes, or in the order you choose, spreading the salsa over the top. Sprinkle with Parmesan cheese. Bon apatite! The above article recently first appeared on the Facebook site of Chris Meletis, ND, at http://facebook.com/drmeletis. Dr. Meletis is much in demand and known nationally for his seminars where he presents his advanced knowledge to other physicians. Having been awarded Physician of the Year early on in his practice, he is esteemed for his profound ability not only to impart knowledge from his extensive experience in practice and research, but to teach his colleagues and patients to think for themselves.